Leif is currently working on a large pastel of Lithia Park’s Lower Duck Pond. 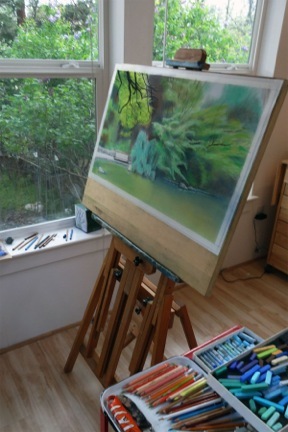 With a myriad of different trees to paint, the picture is a study of movement and flow in numerous shades of green and blues. The completed painting is up for viewing during the month of May. “This painting challenged me in a new way because I used so many different techniques to convey the different leaf structures and light and shadow,” says Leif. Diana is working on a collage honoring Frida Kahlo for Cinco de Mayo. 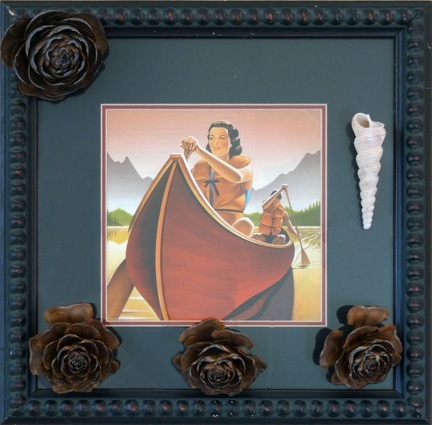 A large piece, the picture contains multiple images of Kahlo, three-dimensional objects recalling the jungle as well as other touches that commemorate this artist’s life. 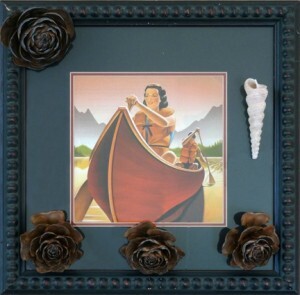 In addition, smaller pieces, such as the one shown above, are available depicting domestic scenes featuring family images for Mother’s Day, May 10.